Frank DiPascali, formerly the finance chief at Bernard Madoff’s investment advisory business, pleaded guilty Tuesday to a slew of charges including fraud. The 10 different counts against DiPascali, who was not granted bond, included securities fraud, falsifying records, mail fraud and conspiracy. “I was a guy who did whatever I was told to do around the office,” DiPascali told the court. “Bernie was a mentor to me and more. I was loyal to a terrible, terrible fault.” Madoff, the disgraced financier, was sentenced in June to 150 years in prison in June after confessing to 11 felony counts for orchestrating a Ponzi scheme. Prosecutors have said it was the largest investor fraud committed by a single person, totaling billions in losses to investors. 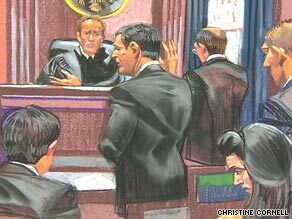 DiPascali told the court he knew for about 20 years that he was engaged in wrongdoing at Madoff’s business. DiPascali admitted to, among other things, using a computer stock program to look up historical prices of stocks to create false statements. “I don’t know how I went from an 18-year-old kid who happened to have a job to standing in front of you today,” DiPascali said.